Among wild creatures with strange legends attached to their name, the northern snakehead is said by some to be a fish that walks. The truth is this unwanted invasive species does move on land, if not by actually walking – and figuring out how they do it has captured the attention of one researcher. 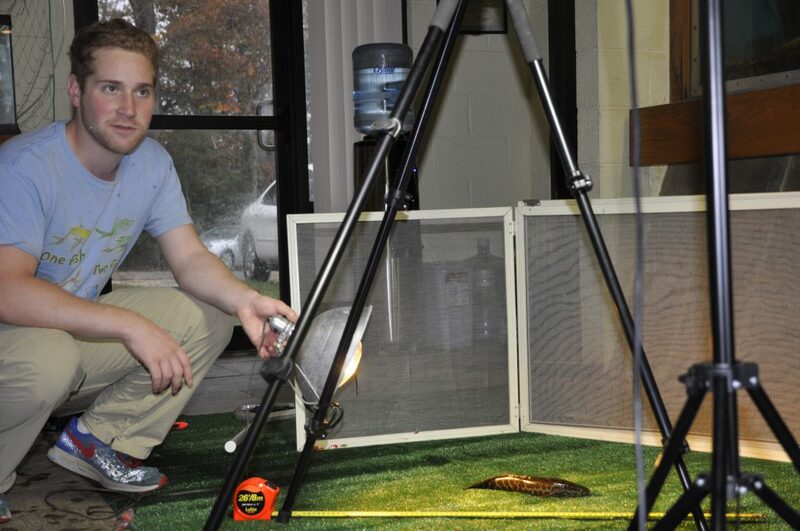 The Maryland Department of Natural Resources is helping Noah Bressman, a Ph.D. candidate at Wake Forest University, in his study of northern snakeheads’ mysterious locomotion. With the ability to remain outside of water for days, the northern snakehead can traverse most terrain. Unlike other fish species, like the mudskipper, which use their fins to propel them forward out of the water, the northern snakehead does things a little differently. Northern snakeheads do this by moving their back fin and head in opposite directions propelling them forward. Yet, the muscle movements that snakeheads use to traverse terra firma has not been fully understood. Bressman has studied nearly a dozen northern snakeheads, adult and juvenile, captured by the department for scientific study. The fish are placed on a large piece of artificial grass, with a dozen or so electrodes recording the fish’s slightest movement, while overhead videos record and still photographs capture its path. While this creature is well-known to be voracious in the water, once on land, it’s a much more timid and even lethargic. Bressman describes the northern snakehead’s behavior on land as “ambitious,” but it will take a lot more time, research and analysis before any conclusions can be made. The researcher will be back in Maryland for more observations in early 2018. 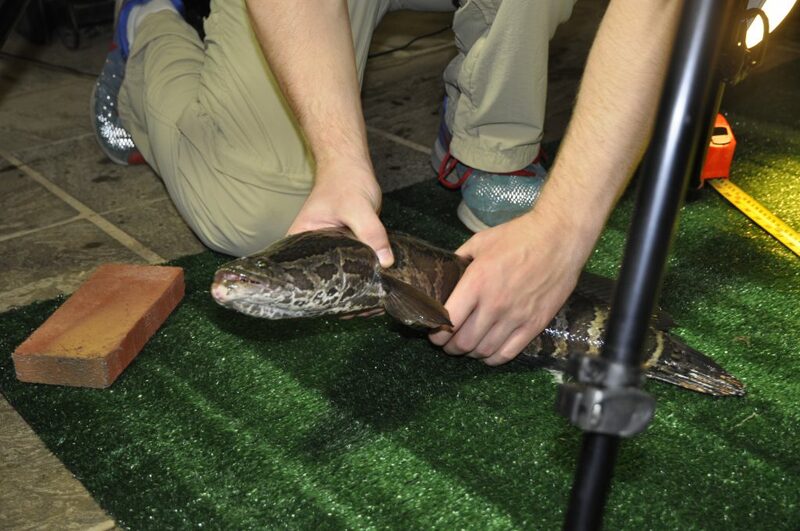 Regardless of scientific interest, the snakehead is invasive and troubling for native species. Maryland anglers are encouraged to catch and keep them, and never return a snakehead to the water alive. There’s no season or catch limit. More information is available here.